Numerous bags of popcorn are taken by ship to the area off the coast of Heligoland. The EMSec (real time service for marine security) consortium partners run through four different scenarios altogether under the supervision of the programme coordination for DLR security research in order to apply the knowledge gained and the developments made over the past three years at the end of the project. In the Situation Centre, an alarm flashes on the screen – a passenger ferry has changed its planned course for no apparent reason. The AIS (Automatic Identification System) signal eventually disappears from the display. By now, all ship-specific information must have been requested and compared in order to quickly clarify the situation and take immediate action. For the EMSec project (Real Time Service for Maritime Security), this is one of the scenarios put to the test from 5 to 9 September. The ship 'Bayreuth', belonging to the German Federal Maritime Police, will be used as the hijacked ferry; the location will be in the German Bight near Heligoland; and the situation centre will be set up and controlled by the EMSec research project in Cuxhaven. The information is relayed in real time from satellites in space and from cameras on board aircraft. "We hope to be able to draw clear and logical conclusions in real time from a variety of data sources and we are pooling the expertise of all our partners to achieve this," explained Stephan Brusch, EMSec project leader at the German Aerospace Center (Deutsches Zentrum für Luft- und Raumfahrt; DLR). The EMSec partners will run through four different scenarios under the supervision of the Programme Coordination for Security Research in order to apply the knowledge gained and the developments made over the past three years at the end of the project. In one scenario, the situation centre will be informed that a ferry travelling between Heligoland and Cuxhaven has unexpectedly gone off course. In response, a satellite image of the area in question will be requested from the monitor with the current display of the maritime position. In the concrete case of the EMSec demonstrator, the team in the situation centre can access information products from the TerraSAR-X, Radarsat 2 or Sentinel-1 radar satellites, as well as the optical satellites Landsat 8, RapidEye and World View. In addition, the demonstration system also makes it possible to deploy and control small aircraft with selectable airborne sensors. In particular, new procedures that envisage the deployment of aircraft in manned or unmanned automatic flight will be developed – on the one hand as a group of several aircraft and on the other as an extension of satellite components. The Diamond DA42 from Airbus DS Airborne Solutions GmbH, with its maritime radar system and AIS reception will be on call, as well as DLR's Do 228 with its MACS optical camera system. In this scenario, the head of the Situation Centre, after combining all the information available, should discover that the ferry (simulated by the maritime police) was simply avoiding a fishing boat (simulated by waterway police) and is now back on its original course. The evasive manoeuvre could not be recognised as such simply from the vessels' AIS signals, since smaller vessels such as fishing boats are not obliged to transmit AIS signals and thus remain 'invisible'. This happens quite often: "Sometimes priority rules are disregarded; sometimes the rules also stipulate that a tanker, for example, must give way to a smaller vessel," says Brusch. "It is not possible to explain this from the maritime situation – unless you combine various sources of data with the experience of the operator in the Situation Centre." This kind of sensor network, which would supply a comprehensive perspective through a complete system, can also be used for the second situation – an actual hijack. The scenario is that the crew of a passenger ferry is forced to go off course and head for a critical maritime infrastructure – in this scenario, a wind farm near Heligoland. In addition, the GNSS (Global Navigation Satellite System) is deliberately disabled so that the entire on-board positioning and location information systems are no longer available. 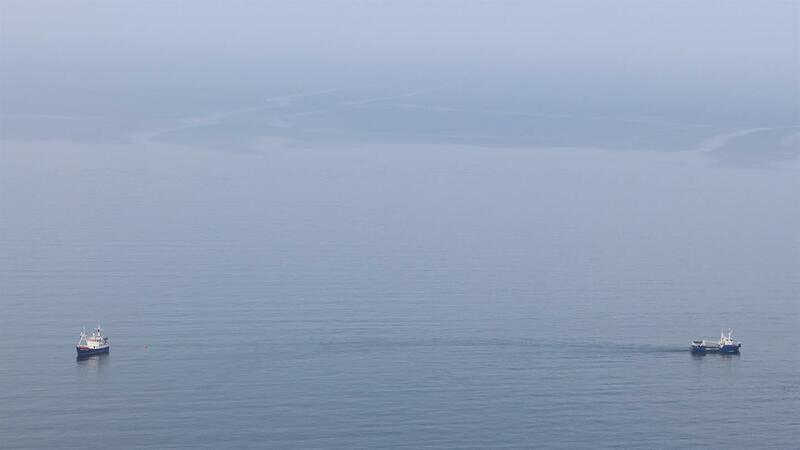 The ferry therefore disappears from the situation picture and is not visible to the operator. With the demonstrator developed by the EMSec project, the source of the interference can be detected and located. But it is also possible to search for the hijacked ship since satellite images and airborne radar, camera and AIS data can be used in a targeted and timely way. The intelligent combination of all the data would make the operator's job in the Situation Centre easier and quicker. One scenario also runs through the possibility that people deliberately jump overboard during an accident or hijack. The rescue personnel of the German Maritime Search and Rescue Service (DGzRS) set out dummies equipped with AIS-SARTs (Search and Rescue Transponders) to simulate the way a person floats in water. When this situation arose in the past, the DGzRS worked with search patterns based on drifting models in combination with current weather conditions. The logical airborne search for people in the water is to be tested with the EMSec demonstrator. The dummies in the water are located by the camera on board the Do 228 and their position transmitted to the Situation Centre. This information could also be received by shipping vessels in the area, which would be able to provide support to the rescue mission. The EMSec partners also intend to demonstrate the detection of pollution caused by liquid or floating hazardous substances using satellite and airborne camera systems. 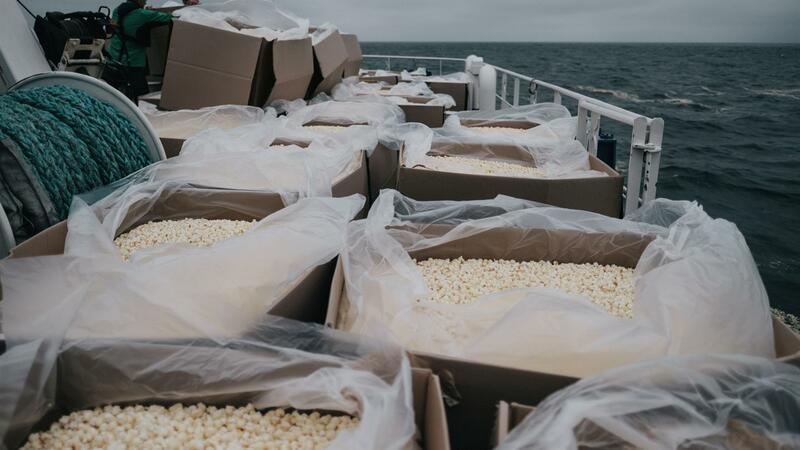 Fifty cubic metres of popcorn were thrown overboard from the maritime police vessel ‘Bayreuth’ to simulate a floating carpet of harzardous material. Satellite sensors in the optical wavelength range as well as flights by the Do 228 will provide information to the situation centre, so that the direction of drift and the extent of the ‘pollution’ can be evaluated. The various scenarios were developed at the start of the EMSec project: in collaboration with maritime police, the DGzRS, the waterway police in the coastal regions and the civil protection organisation (THW), DLR employees and the University of Rostock researchers analysed which maritime threats were most relevant for German coastal areas. The tasks for the EMSec project were defined by the needs of these maritime authorities and organisations who have security duties. "With its basic research, the consortium hopes to provide support for the authorities as end users, by making the information that they need for their corresponding deployments available more quickly and in more diverse and efficient ways," says Brusch about the DLR Programme Coordination for Security Research. Following the one-week campaign in the German Bight, the EMSec project is now closed. "By linking together these various sensor data in one integrated system we are now a step further towards complete functionality." Detailed assessments will show which areas need further research. "In the end, our demonstrator, which is able to bundle information and evaluate it quickly and intelligently, could be used by a large number of other authorities in the field of security – not just in maritime security," says Brusch. The EMSec (Echtzeitdienste für die Maritime Sicherheit – Security; Real Time Service for Maritime Security) project under the leadership of the German Aerospace Center (DLR) Programme Coordination for Security Research is supported by the ‘Research for Civil Protection’ programme run by the German Federal Ministry for Education and Research (BMBF). Participants from DLR include: the Institute for Flight Guidance, the German Remote Sensing Data Center, the Remote Sensing Technology Institute, the Institute of Space Systems, the Institute of Communications and Navigation and the Institute of Optical Sensor Systems. DLR's partners are: ATLAS ELEKTRONIK GmbH, Airbus DS GmbH, Airbus DS Airborne Solutions GmbH, the Civil Protection Organisation, the University of Rostock and other associated partners. Users of the project are: the German Federal Maritime Police, the Waterways Police in the coastal regions, the German Maritime Search and Rescue Service and the Central Command for Maritime Emergencies in an advisory function.